The aim of this guide is to provide deer managers with key points to consider before, during and after the erection of deer fencing. 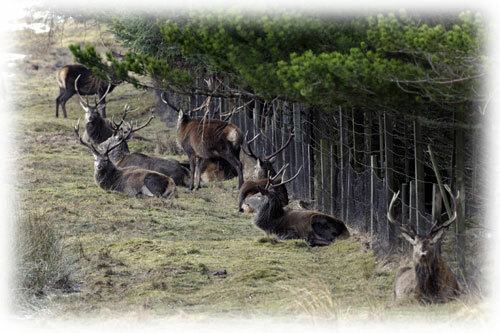 The pubication 'Joint Agency Statement and Guidance on Deer Fencing', available from Scottish Natural Heritage1 provides additional information on this topic. Enclose deer in a specific area-e.g. a farm/park. Management is about making choices. Good managers consider all the options before making a decision. When considering fencing as a management measure, consideration must be given to the full range of options for achieving appropriate deer densities before deciding on whether or not to use, approve or financially support the use of deer fences. Managers should be satisfied that fencing is likely to be the most cost-effective /effective option available. This is dependent on the length/type of fence required, how easy it is to erect/remove, how long it is required to remain deer proof, and the cost/benefit to all affected land management objectives. Confirm it is essential to exclude deer from, or confine deer in, the fenced area. Compare the relative costs/benefits of using alternative methods to achieve the same aim e.g. in the case of protecting woodland; culling the deer, diversionary feeding or using individual tree protection. Take into account indirect costs including the effect on neighbour’s interests and lifetime fence costs i.e. maintenance, removal or replacement if damaged. Consider what type of fencing is required e.g. electric enhanced stock fence or traditional deer fence. Consider whether the deer-proof barrier is to be a permanent or temporary feature. When adequate maintenance is carried out. Comply with legal responsibilities related to designated land areas*. Consult relevant authorities e.g. SNH, FCS, Local Planning Authority**. Assess impacts and understand implications for public safety, deer welfare, biodiversity, landscape and cultural heritage and access. Where the impacts are high, and cannot be reduced through good fence design and siting, adopt an alternative approach if available. Some negative impacts associated with fencing may be proportionally greater for larger enclosures or long barrier fence-lines. Grant aid may be withheld for fences with high potential negative impacts and fencing may be prohibited in some circumstances (e.g. a designated site). Consult the relevant roads authority during planning of any fence which may affect deer movement near or across roads. Assess the need to form a closed circuit system (i.e. using a physical barrier such as a cattle grid on the road) where fences occur close to both sides of a road. Cull or chase out any deer found inside parallel fencing. Where deer are used to crossing, and one side of the road is being fenced, determine whether the increased threat to road users is acceptable. If not, cull or divert deer to a safer area of crossing which may require additional fencing. Ensure that fencing does not channel/funnel deer so that they cross roads where visibility is restricted by bends, crests, tall ground cover on and behind verges etc. Plan and construct fences in such a way so as not to interfere with existing sight lines. Further information on minimum available sight distance to the end of a new fence may be sought from SNH or the road authority. Discuss with the local highways authority the need to locate traffic-warning signs at the approaches to all points where deer will cross once a new fence is constructed. Ensure that the health of deer dependant on the fenced area for food, shelter or migration route remains the same. Either provide alternative grazing and shelter or cull deer. Exclusion of deer should not result in increased winter mortality. Providing access to alternative grazing and shelter may reduce the level of compensatory cull required without compromising deer welfare. This approach will require knowledge of deer movement and availability of alternative shelter. Carry out regular monitoring so that any impacts are quickly identified and addressed. Check whether approvals may be required where fencing is on or likely to have a direct/indirect impact on a designated site of UK or European importance. Contact local Scottish Natural Heritage (SNH) office1 for further information. Where fencing is planned in relation to forestry then the manager should approach the Forestry Commission (Scotland)1 at an early stage to ensure that the proposals meet Grant Aid requirements and Forestry regulations and establish whether an Environmental Impact Assessment is required. Check with SNH1 whether a license is required if fencing construction is likely to disturb protected species such as badgers. Only in exceptional circumstances erect deer fencing within 1km of a woodland grouse lek site. 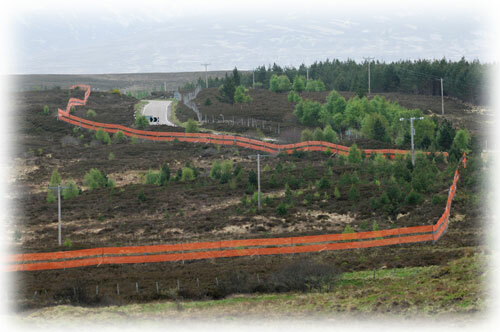 Ensure that fencing location and type (for example orange barrier netting) minimises the threat of collisions within core woodland grouse areas. Such a proposal will need to draw on local information and specialist advice from SNH1, the Forestry Commission’s Guidance Note 11- Deer and Fencing1, the Royal Society for the Protection of Birds (RSPB)1 and the Game and Wildlife Conservancy Trust (GCT)1. Deer displaced by fencing onto designated sites or other fragile sites should be culled where they are likely to cause damage. Fences that incorporate ‘downfalls’ or movement corridors may concentrate large number of deer in small areas. Ensure that the extent of such corridors does not result in localised erosion or damage to the habitat. Prepare a Deer Management Plan**, based on habitat and deer population targets, for any designated site. Collaborate with neighbours as required. Provide a means of crossing the fence, appropriate to the type and number of users and ensure it is maintained. Clearly mark the location of access points and where appropriate provide information to explain why deer fences are necessary, and to indicate when they might be removed ***. Further information is available from Scottish Natural Heritage’s Scottish Outdoor Access Code and the SNH Countryside Access Design Guide1. Use fencing materials and select fence lines which take account of landscape impacts. Contact SNH area staff to discuss mitigation options 1. Locate fences so as to have minimal impact on the landscape and cultural heritage. Relate fence-lines close to landforms and existing landscape features; avoid linear features and archaeological sites. Consult Historic Scotland1 in advance where fencing might affect the site or setting of a Scheduled Ancient Monument. HS and SNH should be consulted on potential impacts within Inventory Landscapes. The Forestry Commission’s Forest Landscape Design Guidelines1 (FC 1994) offers further guidance to reduce the visual effects of different adjacent grazing regimes in the landscape. Maintain fences and remove once no longer required. Include the cost of this when calculating the cost-effectiveness of this method. Changes in habitat and deer management on one landholding can have significant effects on neighbours, Deer Management Groups and local communities. In planning fencing, recognise the interests, legitimate rights and objectives of other landowners and affected communities. Give relevant interests the opportunity to make their views known and be able to show how you have taken these into account. Follow the principle that those who promote a more costly solution to benefit their interests should pay the cost. Collaborate with neighbours if they are affected and inform your Deer Management Group. The type of fence required is determined by the size of enclosure, ground conditions, time for which it will be required and cost. Fencing has high initial costs and requires regular checking and maintenance. • Support netting along wires of high tensile spring steel and link together by spiral lashing rods - standard pig rings commonly used in stock fencing are unsuitable for deer. • Where appropriate install some means whereby any deer which do gain access to the enclosure may escape via deer-leaps, or simple one-way gates. Construct as above, but reduce costs either by selecting less durable materials, for example untreated rather than treated timber for posts, or by using high tensile black plastic or rigid polypropylene netting instead of wire mesh. Various electric fencing systems may be suitable, although they may not be 100% effective against all species. Deer species differ in their susceptibility to electric shocks, with red deer the most, and roe deer the least susceptible. This type of fencing may have high initial costs with constant running costs of electricity. Small wind turbine or solar panels can be used to generate electricity supply. • Single fence to suitable height to prevent deer passing. Construct using a 900mm high single electric stand-off wire, placed on the side of approach, 1.2m from a standard stock fence. • Two parallel fences running 1 meter apart, which prevent deer from jumping.